This is a recipe I have been meaning to share forever. I posted it on Instagram just once and have been receiving comments, emails, tweets about it ever since! - and you know what, this recipe is worth every request! This Avocado Quinoa dish is quite possibly my favourite quick and easy quinoa dish. It's fast, nutritious and delicious and can be served as a side dish - or as your main meal. It literally takes about 15-20 minutes to make - and even less time if you have cooked quinoa in your fridge! 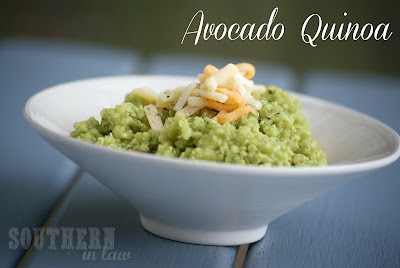 Avocado Quinoa Recipe - serves one but easily multiplied! Cook your quinoa according to directions. Once your quinoa is cooked, mash the avocado and mix through the quinoa over a low heat. Add a little bit of water, if needed, so that your avocado mixes through the quinoa and there are no longer any clumps. Add in seasonings to taste and allow mixture to heat through. Serve immediately, topping with cheese if desired. The cheese you see on top of the quinoa above is just a mexican cheese blend, however, I usually use parmesan cheese, feta cheese or any other grated cheese I have around. And there you have it! Easy as pie... well.. quinoa. So tell me, what is your go-to quick dinner meal? 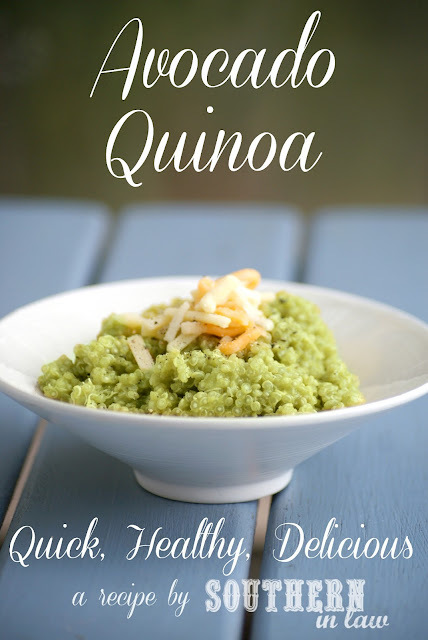 For me, this quinoa is really quick to whip up - but I also like having Spinach and Feta Bakes and Cheesy Quinoa Bakes on hand for days when I don't have time or don't feel like cooking. This is so simple and looks amazing! It's delicious - definitely worth a try!! Yum! This is a great one! My go-to meal would have to be a veggie burger and baked sweet potato wedges. Always simple and always delicious! It so is! Oh yum, nothing beats sweet potato! I've never had a veggie burger, but I totally wish I could eat them as they sound right up my alley. Perhaps I need to make some quinoa burgers! Do you have anything else with this for a meal? And what's your Instagram name? For Jesse I usually add some grilled chicken/fish steak and serve it with a salad. If I don't use an avacado and using guacamole, how many tablespoons or cups is that? Hi Mandi, I'd say 2-3 tablespoons - just mix it through and see if you need to add some more! I stumbled onto your blog from "Bike Bake Blog." This looks awesome. I think I will make it and add some lime, fresh cilantro and some hot peppers. Hey Kevin, thanks for taking the time to leave a comment - your version sounds delicious! You'll have to send me a picture when you make it! We often add some guacamole flavour by adding in diced tomatoes, shallots, and mexican spices and serving it as a cold salad.